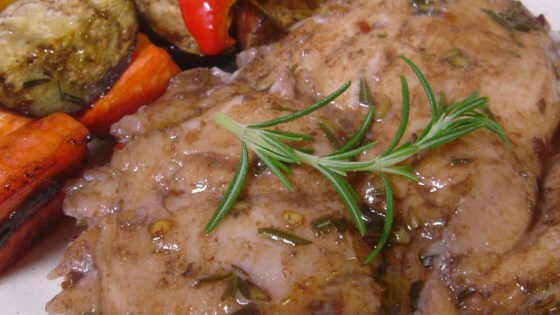 "Chicken and vegetables roasted with a rosemary, balsamic vinegar marinade." Preheat oven to 400 degrees F (200 degrees C). Line a cookie sheet with aluminum foil, and coat with cooking spray. In a large bowl, combine olive oil, balsamic vinegar, rosemary, red pepper flakes, and garlic. Place chicken in the bowl, and marinate 5 minutes. Transfer to a baking dish, reserving marinade in the bowl. Place green bell pepper, red bell pepper, red onion, carrots, and eggplant in the marinade, and toss to coat. Arrange in a single layer on the prepared cookie sheet. Place the chicken and vegetables in the preheated oven. Bake chicken for 20 minutes, or until juices run clear. Bake the vegetables for 35 minutes, or until the edges of the vegetables brown. Absolutely delicious. I used cut up boneledssd chicken breasts and added sliced mushrooms for the last 5 minutes. Delicious. Use whichever vegetables you prefer and change them regularly for variety. Left overs heat up great.